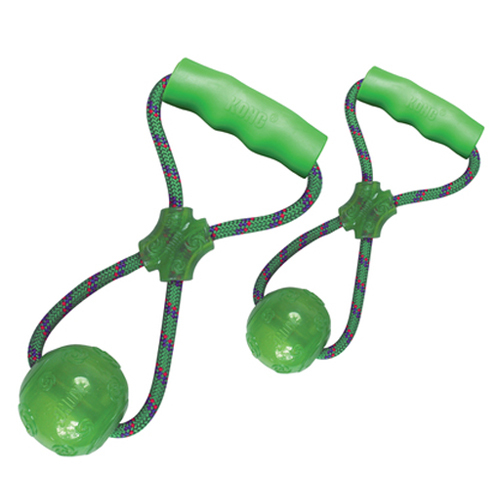 Squeezz Ball With Handle from KONG guarantees throwing, tugging and fetching fun. The strong tugging toys are made of climbing rope and strong rubber and contains a squeaker. Squeezz Ball With Handle from KONG is a durable dog toy and has been specially developed for tugging and fetching games. The toy provides plenty of fun and games for dogs and owners, both indoors and outdoors. Hidden in the Squeezz Ball is a sunken, protected squeaker. The durable toy consists of climbing rope and strong rubber. Have you used Kong Squeezz Ball With Handle before? Let us know what you think about this product.